Make’s Phil Torrone entered this odd gadget, the Tweet-a-Watt, in the Green Gadgets design competition. It’s essentially a Kill-a-Watt with a capacitor and transmitter added that will Tweet your current power usage using a nearby computer or wireless Arduino mini PC. Phil powered the transmitter using a large capacitor that charges, transmits, and then discharges over time. They then used an XBee module to transmit the information read by the Kill-a-Watt, giving you an up-to-the-minute reading of your energy usage. The kit is going open source shortly so you can make your own. 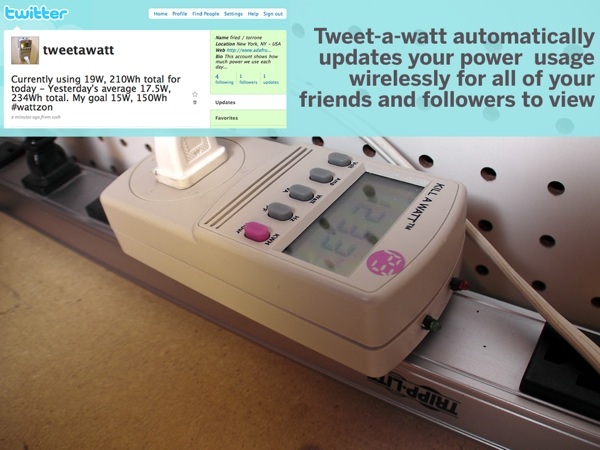 We’re publishing the source, schematics and the idea for others to run with – Energy change and consumption can happen many ways, we feel there is a social imperative and joy in publishing one’s own daily KWH – by sharing these numbers on a service like Twitter users can compete for the lowest numbers and also see how they’re doing compared to their friends and followers.